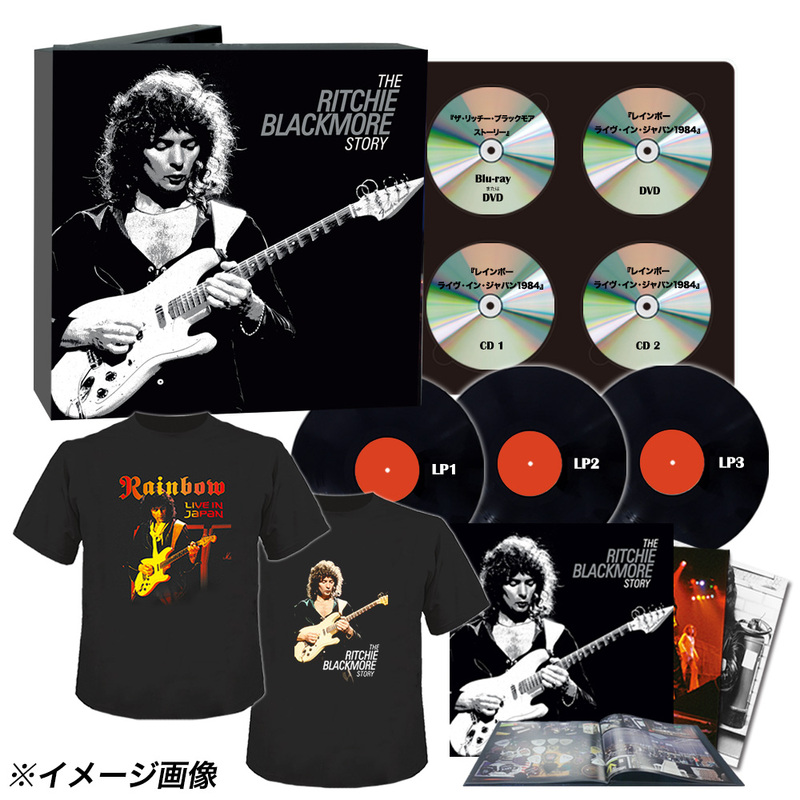 The upcoming Ritchie Blackmore documentary appears to have undergone a facelift — it has been retitled from the quirky Uneasy Rider — The Talented Mr. Blackmore to more pedestrian The Ritchie Blackmore Story and release date has been pushed back to November 6. It will come out on DVD, Blu-ray and digital download. In addition, there will be a 2DVD+2CD deluxe edition. The extra material will be the subtly elusive Rainbow Budokan 1984 show — Live In Tokyo, which to the best of my knowledge have been previously released in full only in Japan on laserdisc. The second DVD, along with both CDs, will contain this last Rainbow performance from March 14, 1984, right before the Purple reunion. Japanese “super premium” limited edition in addition to the above will also include Live In Tokyo on 3LPs and two original design t-shirts. Thanks to Blabbermouth, Ultimate Classic Rock, Ward Records, Lutz Reinert, and mr.trinity for the info. Posted by Nick Soveiko on Saturday, September 12th, 2015, filed under News. You can follow comment on this post through the RSS 2.0 feed. You can skip to the end and leave a comment. Pinging is currently not allowed. Shouldn’t Black Masquerade be 1995, not 1985? Could be worse, but I hope the Japan show is from master and not just the bootleg sold officially like the Donnington show included on the Down To Earth re-issue. Epic fail if so. The rest at least does intrigue. Thanx for clarifying. Too good to be true to have 2 docs coming out in 2 months time. No mention of his pre Purple career and no footage of MK I line up! “Wring That Neck ” Paris 1970 ????!!!!!!! Speed King is not Beat Club either. These are small gripes. The list of material doesn’t make this an immediate must buy. what would be the second doc? It’s spelled ‘Donington’, not ‘Donnington’. Bands have been playing there for over thirty-five years and people are still spelling it incorrectly! Deluxe Edition now listed on Amazon UK for under £35. I see the one on Amazon UK is the 2xDVD/2CD version, anyone any idea where the 2xBluray/2CD version is being sold? Also, any ideas where the super premium version is being sold, can’t find it on HMV Japan. The price of the Deluxe Edition on Amazon UK has now dropped to under £25. I received my deluxe edition yesterday. Nice item ! Interesting documentary ! And the part concerning Ian Gillan naked and spiders in the bonus interviews is really funny ! I have watched the DVD a few times now and recommend it to RB fans. Not a lot of new stories but the comparison of Jim Morrison and Ian Gillan ‘looks wise’ is a new one. I love the bonus bit about Gene Vincent and J. Lee Lewis as told by RB even though the stories have been in print and the Gene story was in the Kevin Spacey movie ‘Telstar” about Joe Meek. As far as the Tokyo dvd, I owned the Jap Laser Disk when it came out officially in the mid 80’s and do not recall the show image being so soft focus. But then we have been spoiled with Hi Def dvd images since then.